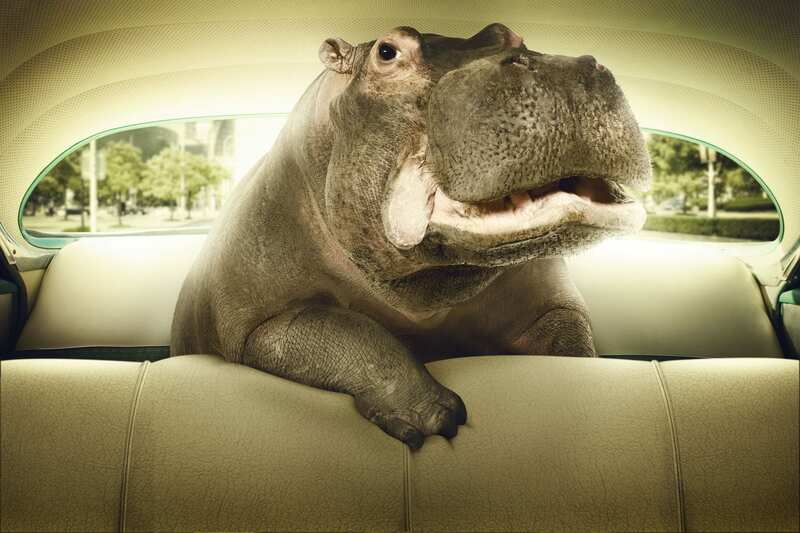 Hippopotamus wallpapers for your PC, Android Device, Iphone or Tablet PC. If you want to download Hippopotamus High Quality wallpapers for your desktop, please download this wallpapers above and click «set as desktop background». You can share this wallpaper in social networks, we will be very grateful to you. 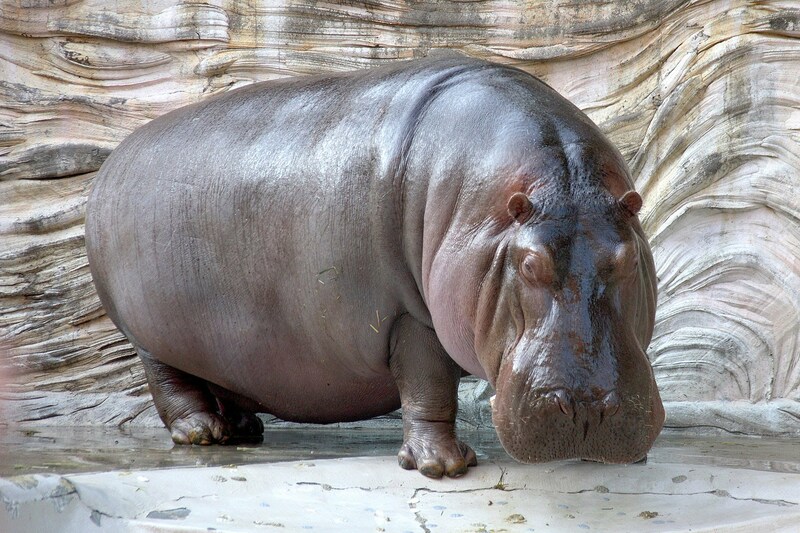 Common Hippopotamus or hippopotamus (Hippopotamus amphibius) – Class pet cloven-hoofed mammals squad. 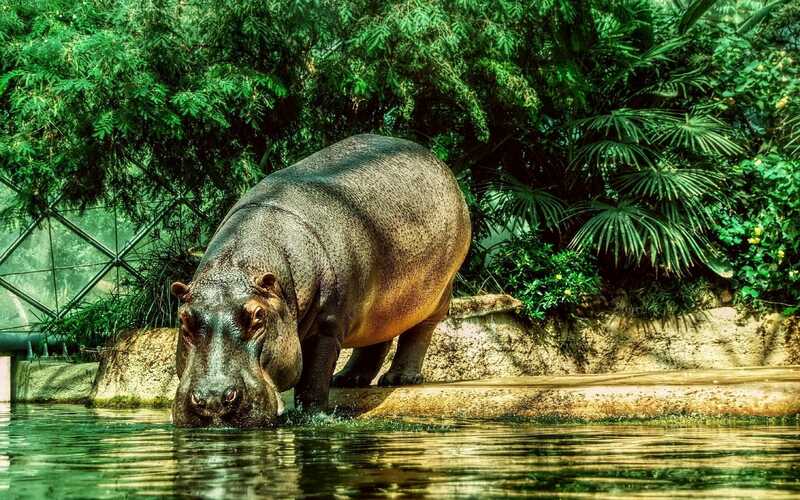 He lived at the beginning of the last century in a large area from the Nile to Cape Town, but the flurry of activity has contributed greatly reduce the hippo population. 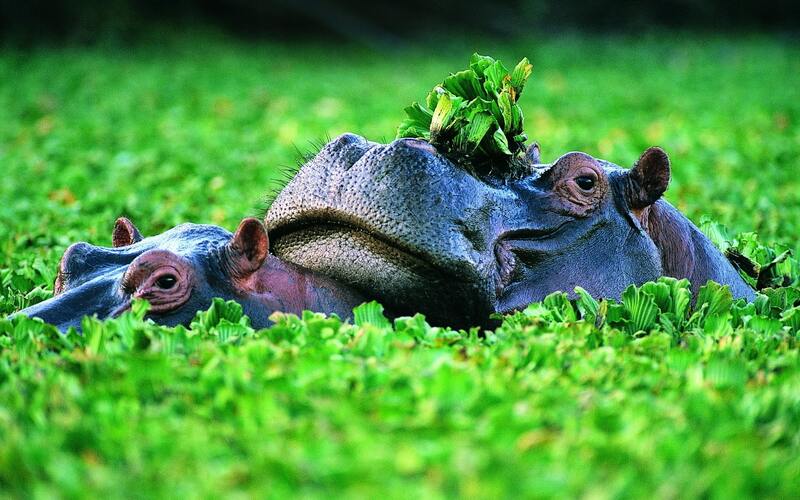 Hippopotamus, contrary to the opinion of its origin from pigs, it is a close relative of cetaceans. His barrel-shaped body, with thick short legs that end tetradigitate hooves, combined small membrane. The presence of membrane caused by walking on mud – fingers apart, stretched membrane and does not fail behemoth, forming support. 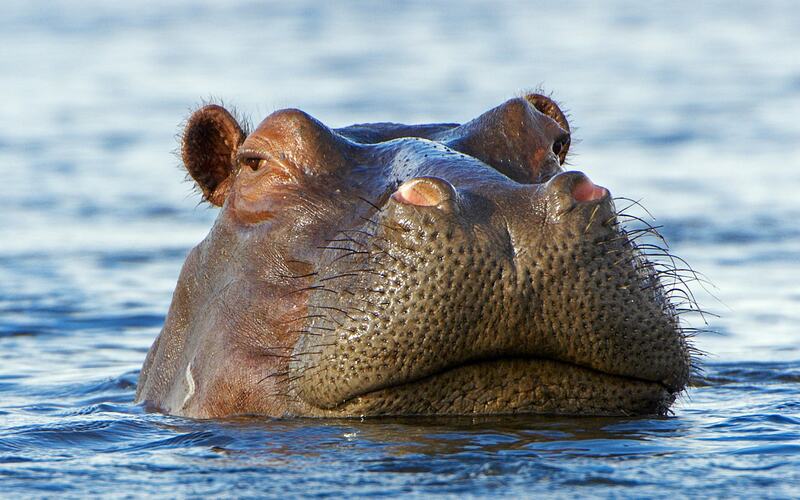 Surprisingly the location of eyes, ears and nostrils of a hippopotamus on a massive, thick heavy head. These organs are located almost on the same line, allowing to breathe, hear and see at the same time while being under water. 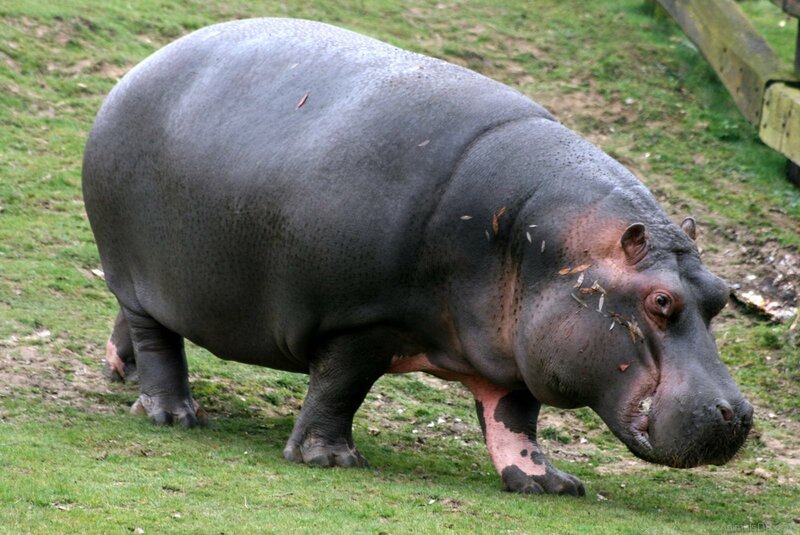 Weight hippos reach four tons in average, their weight is from 3000 to 3200 kg. Length – about four meters, the height of the shoulders – up to 165 cm. Color skins hippo gray-brown, has a pinkish hue. The skin has almost no hair, small hairs are only on the tail and muzzle. 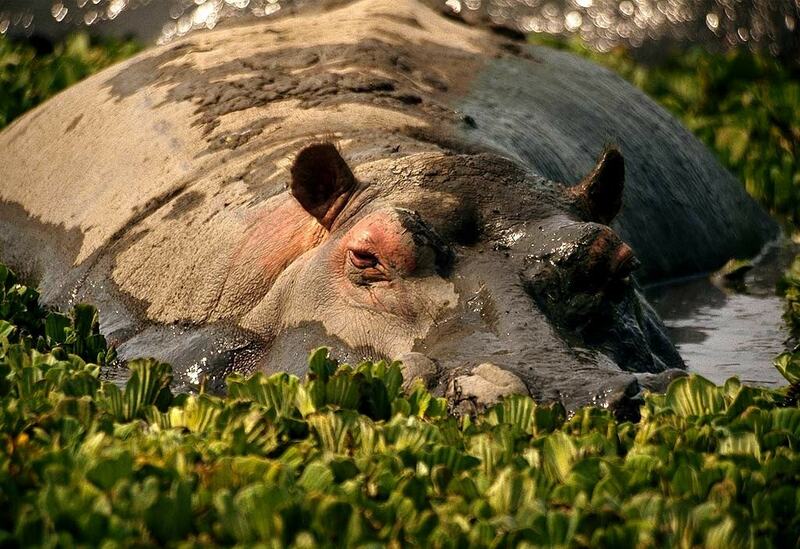 Skin of hippopotamus covered by special glands, which, when dry skin, release secret unusual red color. From the outside it looks like this: is a behemoth and pours bloody sweat. Even the ancients were surprised by this fact, and thought that the secret protects the skin from drying out. Later it turned out that it is rather antiseptic. 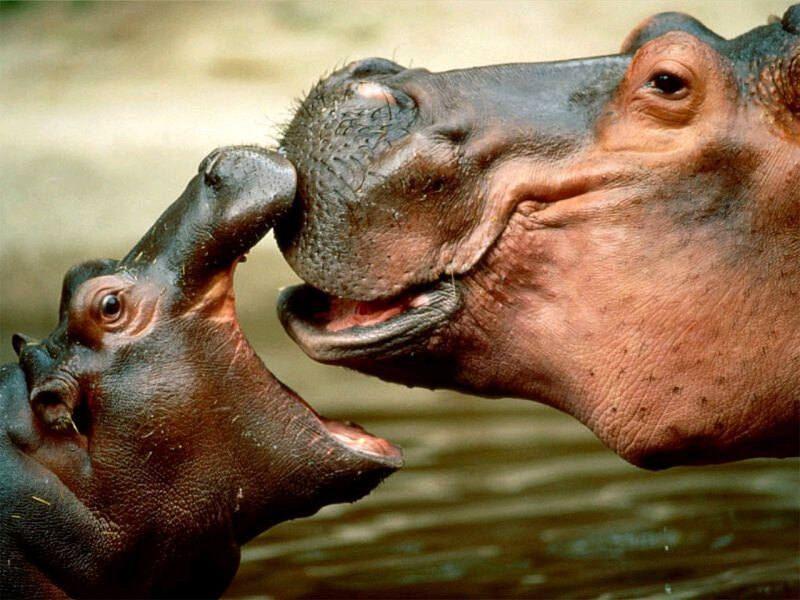 Mouth Hippo is unique: he knows how to open it up so that the angle between the jaws is about 150 degrees. Teeth rarely placed on the lower jaw has teeth which have no roots and grow throughout life. 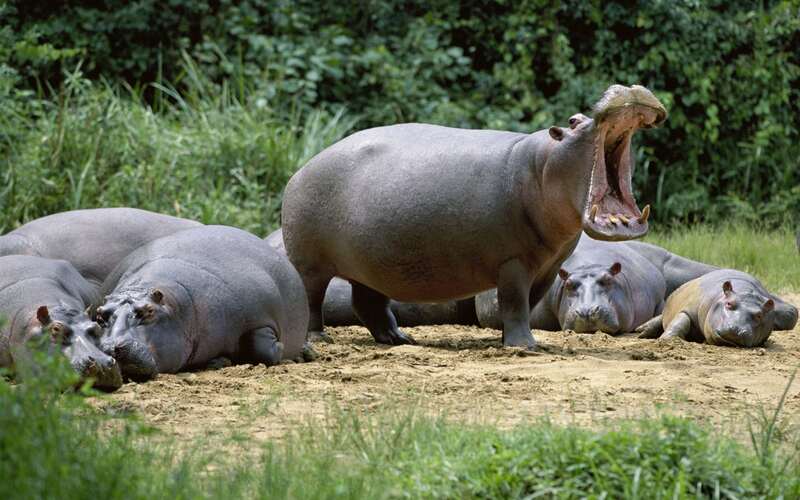 The longest fang hippo was 65.5 cm, and they are appreciated even more than an elephant. The teeth are covered with a solid yellowish plaque (pictured below is clearly visible). 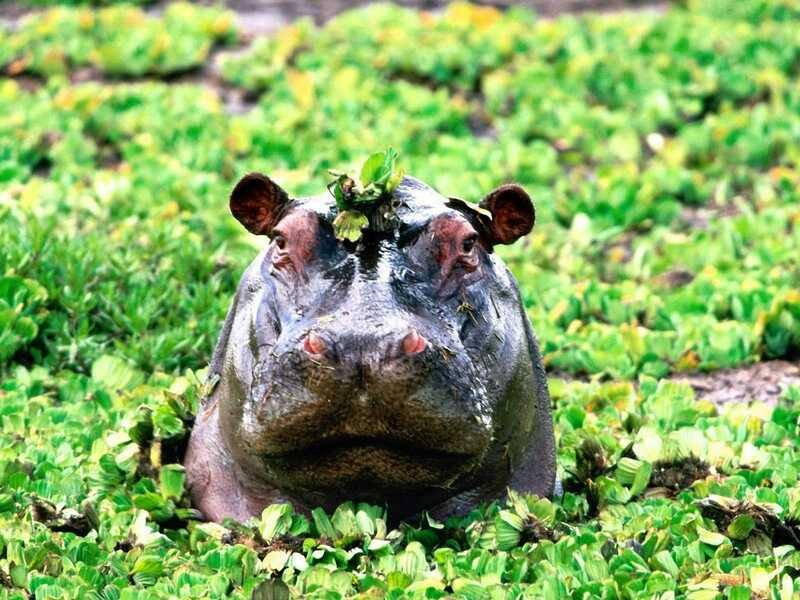 Hippos do not like deep space and choose the smaller, up to 1.2 meters, ponds with abundant vegetation on the sloping shores. Thus, they can not be completely submerged and move freely along the bottom, sticking out of the head. 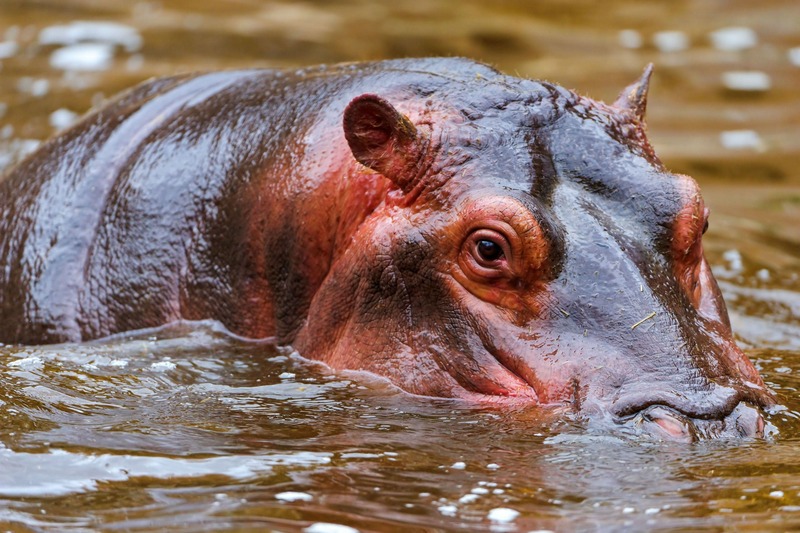 But this does not mean that bad hippos swim: they are excellent diving and can survive under water for about 4-5 minutes, and are excellent swimmers. 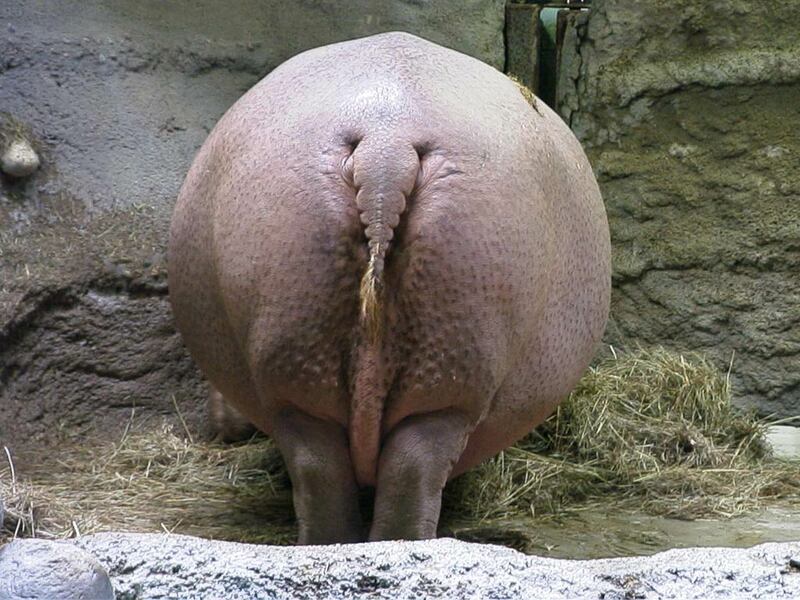 Hippos have to get out on land for a few hours to get food. On the shore they look awkward, sluggish. Nevertheless, a hippo is able to make long jumps. 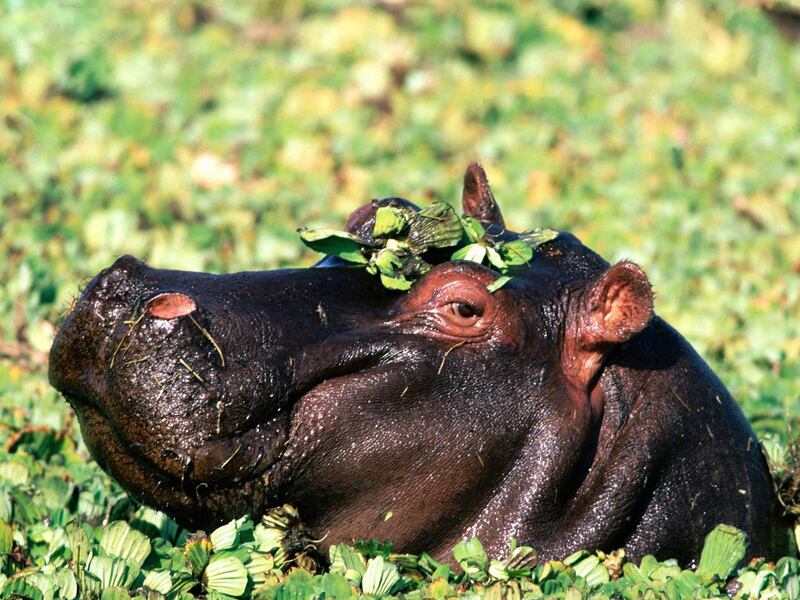 Hippos live in herds in which to observe the strictest hierarchy. Family live in a particular area of the reservoir and consist of 10-20 females with calves and male aging, landlord of the harem. Certain communities keep growing up, but have not yet reached puberty, individuals. 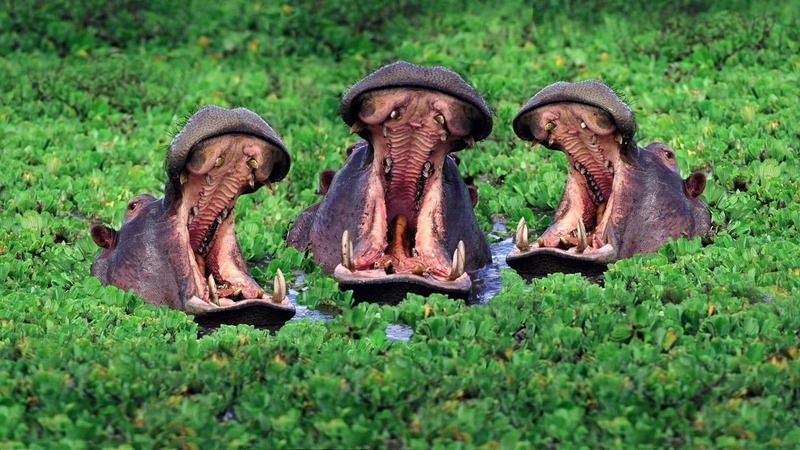 Males hippos living separately. They are quite aggressive and are often put up a fight with each other. Contractions hippos often krovoprolitnyKak generally these fights begin with certain rituals, but have been going on without complying with the rules and sometimes end with the death of one of the males (see hippos fight video below). 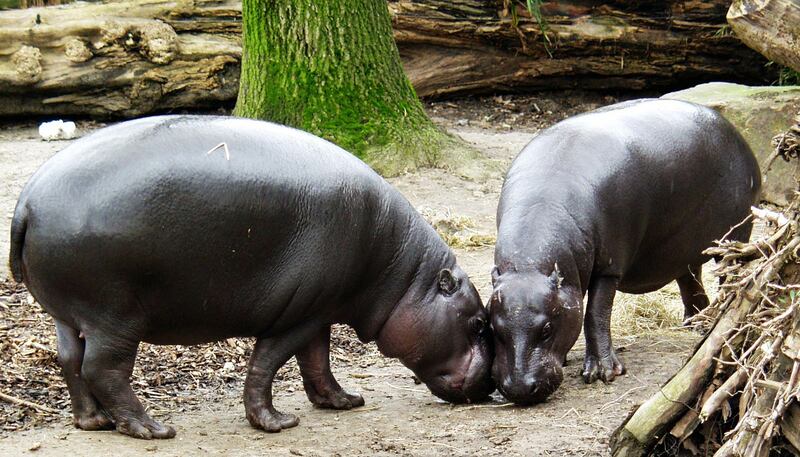 Contractions hippos – a horrible sight: the males tear each other canines, and even bleeding opponent rival pursuing, biting and finishing off. 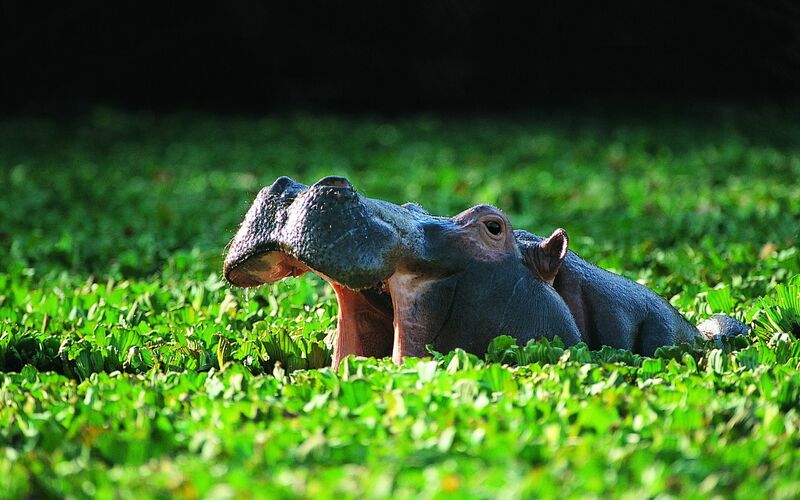 They feed the hippos mostly vegetation that grows on the banks of reservoirs. 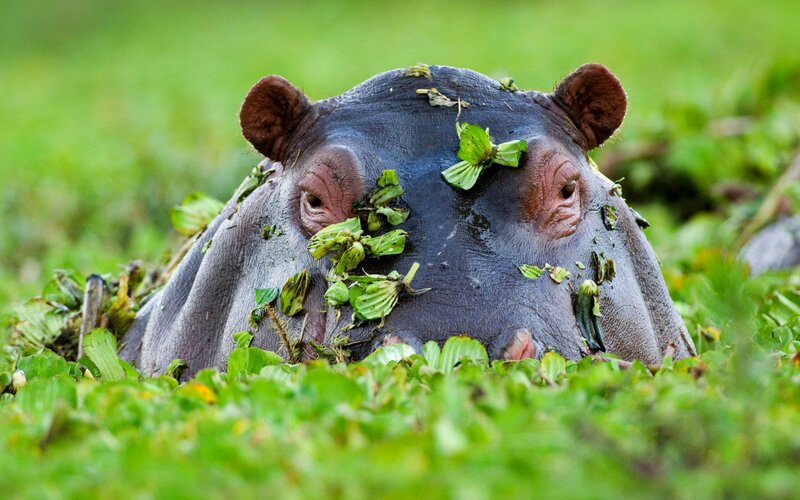 The day hippopotamus consumes about 40 kg of grass, representing 1.1-1.3% of its own weight. It helps to digest such a large number of long fiber digestive system – about 60 meters – and three-chambered stomach. 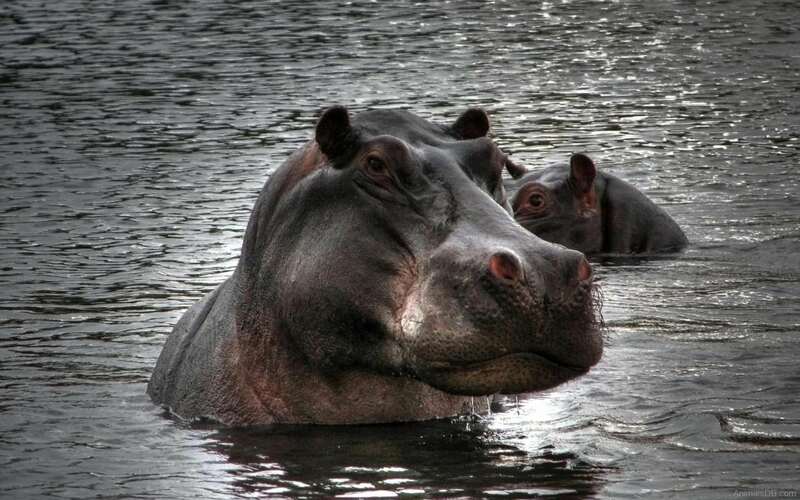 Hippos are active in the primary degree at night, when their delicate skin is not exposed to ultraviolet light, does not dry and does not crack. During the day they lie dormant in the shallows and bays, the night out to graze. Each hippo own land, pasture, which he marks their droppings, as well as all the tagged path trodden by the pond to pasture. The trails that were beating themselves up hippopotamus pond for generations, are an amazing sight. They even manage to beat a stone half-meter ditch, on which, in the event of danger, quickly rush to the speed of the train back to the water. It is easy to assume what will happen to those who dare to stand in the way of the animal at the time. For 7 years in females and 9 to – males reach sexual maturity. Mating takes place twice a year, in August and fevrale.malenky gippopotamchik female bears fruit for about eight months (240 days), and it gives birth in shallow waters where there is and mating. 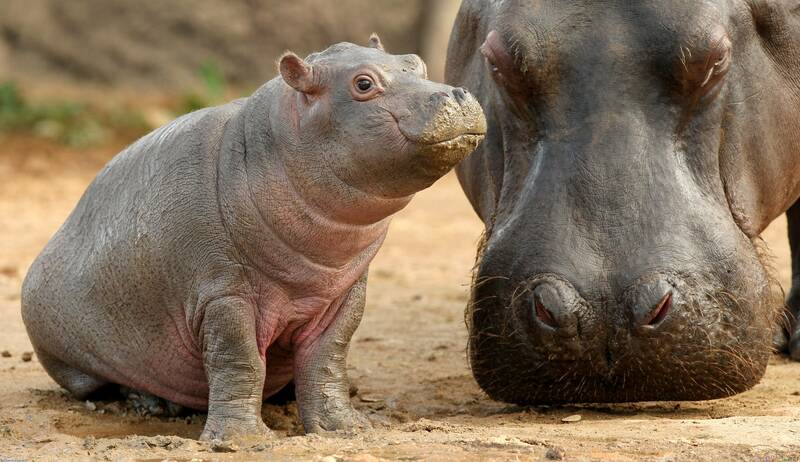 Little Hippo born not small – weighing about 50 kg, length -. 120 cm is enough to quickly mastered the kid and the next day can go with his mother. However, it will have a long time to protect the baby, closing his body even from the male, that can easily trample baby. 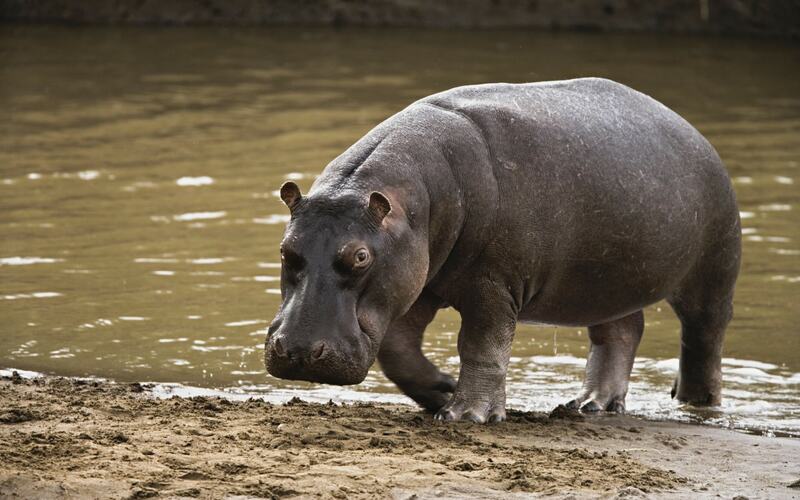 In addition, small hippos often become victims of lions, hyenas, leopards and African Wild Dog. Lions also pose a threat and an adult hippos, crocodiles and here, contrary to popular belief, are not dangerous for the hippos.